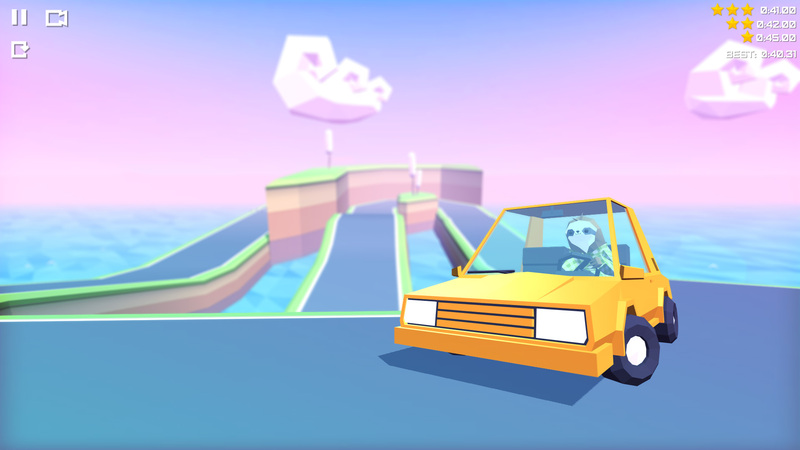 Slowdrive is a game about long way home, but actually it's about your driving skills. The sleepy sloth left his home because of a butterfly effect (literally) and now wants to return. Road home is divided into very short (from a few seconds long) but tricky stages. 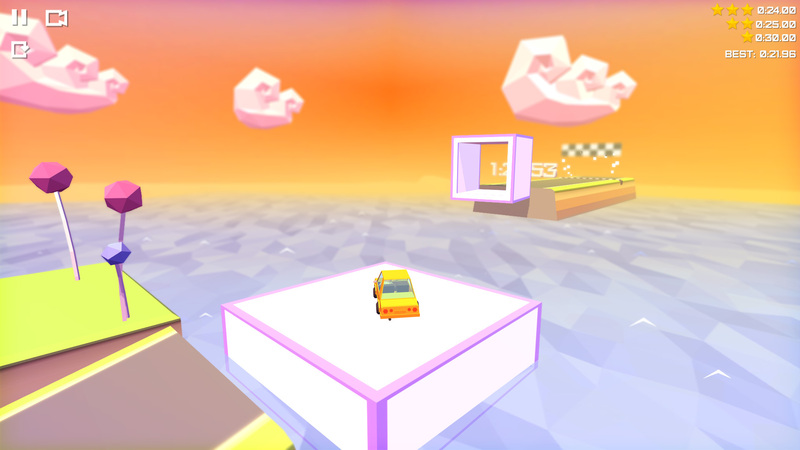 To complete this hard path you have to hone your driving skills and learn every track. If you get 3 stars you will be able to view top-10 on this level. Click on the ghost icon to load it. If your result not shown in top-10 try to update the game. Earn three stars with 1st person camera to get the golden wheel! Collect hidden leaves to unlock paints. 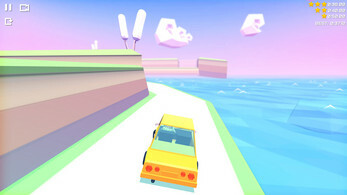 Complete all levels in chapter to unlock extra island levels and car body. Slowdrive is Now Available on Steam! Hey man had a ton of fun while playing this game!Absolutely loved it & i have the feeling that i kinda mastered it xD Thanks for sharing your work with us! Hope to hear more from you and 'bout your feature projects soon! This sloth and I have been through it all. And by all, I mean this episode! It's a roller coaster of emotion from the initial happiness of being back in the drivers seat, to wanting to reach through the monitor and strangle the dude! Hope you enjoy! So frustrating but super fun!!!! Love it! Hi! So yeah we all know that this game is really frustrating lol, but it is a cool game and I already made a series about it on youtube in INDONESIAN! Check it out! TERIMA KASIH! This was fun! A little rage-inducing at times, but fun nevertheless! I made a let's play as well, hope it helps! The whole idea of you being a sloth and riding to get the best time is just silly and fun! Specially with the different colorful worlds that make it really different and having to go certain ways to get to the end adds in pressure to get it done on time! I may not be the quickest person on the road but I bet if you call Uber and recommend Sammy the sloth I think he will get the job done! I'm not big on car games and this was still entertaining. Of course, having sloths is always good for bonus points. 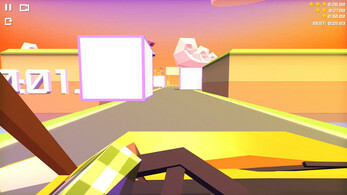 The visuals and art style for this were all pretty nice and everything looked very clean. The only thing I felt was missing was background noise, like ambience or music. Good job overall. Made a second video on a whim! Good gravy, this is challenging. Excellent Lo Poly driving game by far that I've played! And you play as a Sloth... EVEN BETTER! I was challenged by a fellow youtuber and friend AstraVex to see how well I could do and well I think I did pretty decent...ish xD none the less I'll leave my video here so you guys can see the outcome :D Really fun game to play! Here's my third video on this game. I still think it's a great game but I still belive that one star should be easy to get! I know I'm bad at the game, and I know some other people are as well but it doesn't matter. You should get one star by just completeing the level. You should get 2 stars for what one star is now (or maybe a little quicker). And you should get 3 stars for completeing the level as fast as it is possible. That would make the game make more sense and in my opinion draw more people to the game; instead of pushing them away because there's a level they can't complete. But anyway, I still had fun and I can't wait for the full game and I hope you take on board what I've said. So much rage, but so much fun! Can't wait to play some more! IMMA SLOTH AND I'M DRIVING! I managed to survive some of the levels here. I already failed the real driving test 4 times. Now I gotta fail at this too LMAO. Getting through levels just like a sloth would. Expect more videos! I love this game and I hope you can all Believe In Steve!